We are mighty excited to be headin' back through beautiful BC this August! 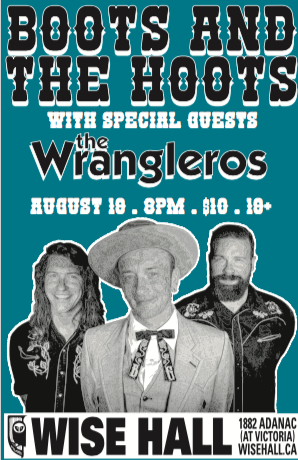 The fine folks at The Wise Hall & Lounge will be hosting Boots & The Hoots for a wild night of Honky Tonkin' Sunday August 19th. Shine up your boots, grab your best dancin' pardner and join us for the show!